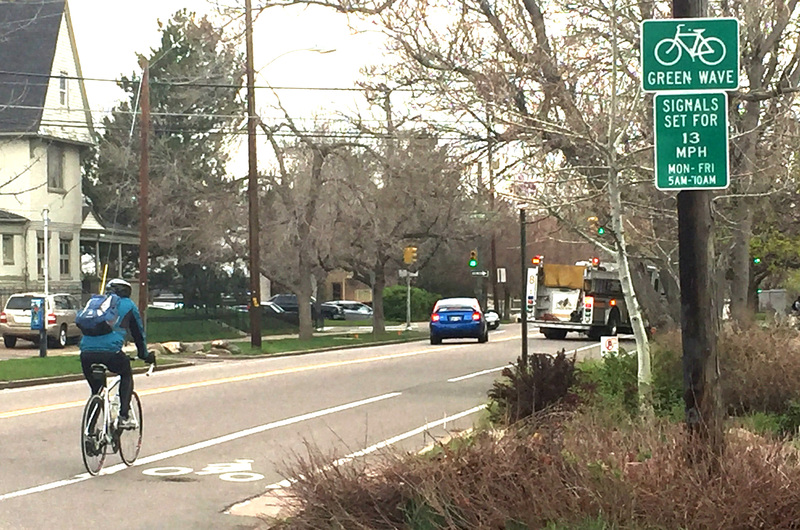 Denver Public Works just changed 16th Avenue’s traffic signals to align with biking speeds, so people on bikes will hit fewer red lights and drivers will travel at safer speeds. The bike-friendly traffic signals are in effect weekdays between 5 a.m. and 10 a.m, heading west into downtown. They stretch from Park Avenue West to Broadway, about one mile. This type of signal timing is called a “green wave” — if you’re moving at a certain speed you’ll see green lights at every intersection. Until now, 16th Avenue’s traffic signals were coordinated to keep people traveling at typical car speeds moving, meaning drivers get a cascade of green lights while people on bikes hit one red after another. Now the lights are timed for 13 mph during the morning rush hour. After a light turns green, someone maintaining a typical biking speed will get a series of greens. That means fewer stops and a more efficient bike ride. DPW picked 16th Avenue because it’s one of the most popular bike corridors in the city. Up to 900 riders use it each day, Bronson said, mostly in the morning. There’s no green wave heading out of downtown because engineers think the uphill portions of eastbound 16th result in bicycle speeds that vary too much to make the technique effective. During the hours the new signal timing is in effect, it should make 16th — a street with one of the city’s highest bike crash rates — safer for everyone. Lights timed for 13 mph traffic reduce the incidence of dangerously high motor vehicle speeds. Green waves for bicyclists are common in bike-friendly cities like Copenhagen. It’s rarer stateside, but Denver joins San Francisco and Chicago in using the technique. This should be a low-cost improvement that Denver can expand to other key streets in the city’s bike network. We’ll have more on the upgrade soon. In the meantime, take a look at Streetfilms’ coverage of the green wave on San Francisco’s Valencia Street. I’m all for things moving this direction. However, I am one of those 900 people per day. The current (or previous I suppose) timing is perfect right now for my speed and most others I see. More cyclist than not travel a good speed over 13 mph… some around 20+ on the downhill section. I’m optimistic, but concerned that it may be too slow. Don’t know until you try though… progress isn’t always perfect.